The Karl G. Jansky Very Large Array (VLA) is a centimeter-wavelength radio astronomy observatory located in central New Mexico on the Plains of San Agustin, between the towns of Magdalena and Datil, ~40 miles (64 km) west of Socorro. The VLA comprises twenty-seven 25-meter radio telescopes deployed in a Y-shaped array and all the equipment, instrumentation, and computing power to function as an interferometer. Each of the massive telescopes is mounted on double parallel railroad tracks, so the radius and density of the array can be transformed to adjust the balance between its angular resolution and its surface brightness sensitivity. Astronomers using the VLA have made key observations of black holes and protoplanetary disks around young stars, discovered magnetic filaments and traced complex gas motions at the Milky Way's center, probed the Universe's cosmological parameters, and provided new knowledge about the physical mechanisms that produce radio emission. The VLA stands at an elevation of 6970 ft (2124 m) above sea level. It is a component of the National Radio Astronomy Observatory (NRAO). The NRAO is a facility of the National Science Foundation operated under cooperative agreement by Associated Universities, Inc. The radio telescope comprises 27 independent antennas, each of which has a dish diameter of 25 meters (82 feet) and weighs 209 metric tons (230 Short tons). The antennas are distributed along the three arms of a track, shaped in a wye (or Y) -configuration, (each of which measures 21 km/13 miles long). Using the rail tracks that follow each of these arms—and that, at one point, intersect with U.S. Route 60 at a level crossing—and a specially designed lifting locomotive ("Hein's Trein"), the antennas can be physically relocated to a number of prepared positions, allowing aperture synthesis interferometry with up to 351 independent baselines: in essence, the array acts as a single antenna with a variable diameter. The angular resolution that can be reached is between 0.2 and 0.04 arcseconds. There are four commonly used configurations, designated A (the largest) through D (the tightest, when all the dishes are within 600 m of the center point). The observatory normally cycles through all the various possible configurations (including several hybrids) every 16 months; the antennas are moved every three to four months. Moves to smaller configurations are done in two stages, first shortening the east and west arms and later shortening the north arm. This allows for a short period of improved imaging of extremely northerly or southerly sources. The frequency coverage is 74 MHz to 50 GHz (400 to 0.7 cm). The Pete V. Domenici Science Operations Center (DSOC) for the VLA is located on the campus of the New Mexico Institute of Mining and Technology in Socorro, New Mexico. The DSOC also serves as the control center for the Very Long Baseline Array (VLBA), a VLBI array of ten 25-meter dishes located from Hawaii in the west to the U.S. Virgin Islands in the east that constitutes the world's largest dedicated, full-time astronomical instrument. In 2011, a decade-long upgrade project resulted in the VLA expanding its technical capacities by factors of up to 8,000. The 1970s-era electronics were replaced with state-of-the-art equipment. To reflect this increased capacity, VLA officials asked for input from both the scientific community and the public in coming up with a new name for the array, and in January 2012 it was announced that the array would be renamed the "Karl G. Jansky Very Large Array". On March 31, 2012, the VLA was officially renamed in a ceremony inside the Antenna Assembly Building. The VLA is a multi-purpose instrument designed to allow investigations of many astronomical objects, including radio galaxies, quasars, pulsars, supernova remnants, gamma-ray bursts, radio-emitting stars, the sun and planets, astrophysical masers, black holes, and the hydrogen gas that constitutes a large portion of the Milky Way galaxy as well as external galaxies. In 1989 the VLA was used to receive radio communications from the Voyager 2 spacecraft as it flew by Neptune. A search of the galaxies M31 and M32 was conducted in December 2014 through January 2015 with the intent of quickly searching trillions of systems for extremely powerful signals from advanced civilizations. It has been used to carry out several large surveys of radio sources, including the NRAO VLA Sky Survey and Faint Images of the Radio Sky at Twenty-Centimeters. In September 2017 the VLA Sky Survey (VLASS) began. This survey will cover the entire sky visible to the VLA (80% of the Earth's sky) in three full scans. Astronomers expect to find about 10 million new objects with the survey — four times more than what is presently known. The driving force for the development of the VLA was David S. Heeschen. He is noted as having "sustained and guided the development of the best radio astronomy observatory in the world for sixteen years." Congressional approval for the VLA project was given in August 1972, and construction began some six months later. The first antenna was put into place in September 1975 and the complex was formally inaugurated in 1980, after a total investment of $78.5 million. It was the largest configuration of radio telescopes in the world. With a view to upgrading the venerable 1970s technology with which the VLA was built, the VLA has evolved into the Expanded Very Large Array (EVLA). The upgrade has enhanced the instrument's sensitivity, frequency range, and resolution with the installation of new hardware at the San Agustin site. A second phase of this upgrade may add up to eight additional dishes in other parts of the state of New Mexico, up to 300 km away, if funded. Magdalena Ridge Observatory is a new observatory under construction a few miles south of the VLA. It includes an optical interferometer and is run by VLA collaborator New Mexico Tech. The VLA has appeared repeatedly in American popular culture since its construction. The VLA is present in the 1997 movie Contact, as the location where the alien signal is first detected. The VLA features in plans to save the world from satellites being pulled from orbit in the second volume of the comic book series G.I. Joe: America's Elite (2005-2008). British artist Keith Tyson created a 300 piece sculpture called Large Field Array (2006-2007) named after the VLA. In the 2009 science-fiction film Terminator Salvation, the VLA is the location of a Skynet facility. At the beginning of the film the site is attacked by Resistance forces. The VLA is featured on the cover of Dire Straits's 1993 live album On The Night, as well as in its video. An edited version of the same image was later used in the album Encores, by the same band. The Bracewell Radio Sundial on the VLA walking tour, seen from the south. Named for Ronald N. Bracewell, this sundial marks on the ground positions of the shadow of the central sphere (the gnomon) at different times of day and times of year. The shadow on Dec 22, 2017 falls very near the winter solstice line and the 1:00 PM (solar time) mark. The other two lines of markers north of the gnomon are for the equinoxes and the summer solstice. Additional lines of markers south of the gnomon mark positions of "shadows" of the radio sources Cygnus A and Cassiopeia A. The posts at the back of the sundial were recovered from Bracewell's radio telescope array at Stanford University, abandoned in 1980, where they had been signed by visitors with chisels at his invitation. The VLA is located between the towns of Magdalena and Datil, about 50 miles (80 km) west of Socorro, New Mexico. U.S. Route 60 passes east–west through the complex. The VLA site is open to visitors year round during daylight hours, and on every first and third Saturdays of the month, special guided and behind-the-scenes tours are offered. A visitor center houses a small museum, theater, and a gift shop. A self-guided walking tour is available, as the visitor center is not staffed continuously. Visitors unfamiliar with the area are warned that there is little food on site, or in the sparsely populated surroundings; those unfamiliar with the high desert are warned that the weather is quite variable, and can remain cold into April. For those who cannot travel to the site, the NRAO created a virtual tour of the VLA called the VLA Explorer. ^ a b "Visit the VLA". public.nrao.edu. National Radio Astronomy Observatory. Retrieved 2015-03-24. ^ "Welcome to the Very Large Array!". vla.nrao.edu. National Radio Astronomy Observatory. Retrieved 2015-03-24. ^ Holley, Joe (May 29, 2008). "Hein Hvatum, 85; Engineered Telescope to the Heavens". The Washington Post. Retrieved 2015-03-24. ^ a b "An Overview of the Very Large Array". 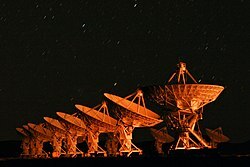 vla.nrao.edu. National Radio Astronomy Observatory. Retrieved 2015-03-24. ^ "Very Long Baseline Array". science.nrao.edu. National Radio Astronomy Observatory. Retrieved 2015-03-24. ^ Associated Press (October 14, 2011). "New Mexico Radio Telescope Seeking New Name". ABC News. Archived from the original on 2011-10-16. ^ Palmer, Jason (October 15, 2011). "Very Large Array telescope in public call for new name". BBC News. Retrieved 2015-03-24. ^ Finley, Dave. "Iconic Telescope Renamed to Honor Founder of Radio Astronomy". NRAO.edu. National Radio Astronomy Observatory. Retrieved 2015-03-24. ^ Finley, Dave. "Famous Radio Telescope Officially Gets New Name". NRAO.edu. National Radio Astronomy Observatory. Retrieved 2015-03-24. ^ Gray, Robert H.; Mooley, Kunal (14 February 2017). "A VLA Search for Radio Signals from M31 and M33". The Astronomical Journal. 153 (3): 110. arXiv:1702.03301. Bibcode:2017AJ....153..110G. doi:10.3847/1538-3881/153/3/110. ^ Murphy, Davis. "VLA Sky Survey". National Radio Astronomy Observatory. Retrieved 30 September 2017. ^ a b Barbuzano, Javier. "Iconic Radio Telescope Begins 7-year Search for New Objects". Sky & Telescope. Retrieved 30 September 2017. ^ Tucker, Wallace; Tucker, Karen (1986). The Cosmic Inquirers: Modern Telescopes and Their Makers. Harvard University Press. ISBN 0674174356. ^ "The Expanded Very Large Array Project: A Radio Telescope to Resolve Cosmic Evolution". aoc.nrao.edu. National Radio Astronomy Observatory. Retrieved 2015-03-24. ^ a b c Howard Hughes (30 May 2014). Outer Limits: The Filmgoers' Guide to the Great Science-fiction Films. I.B.Tauris. pp. 91–. ISBN 978-1-78076-166-4. ^ Guidebook for the Scientific Traveler. Rutgers University Press. pp. 86–. ISBN 978-0-8135-4918-7. ^ Robinson, Walter (November 11, 2007). "Weekend Update". Artnet.com. Artnet Worldwide Corporation. Retrieved 2015-03-24. ^ Joseph T. Page II (6 May 2013). New Mexico Space Trail. Arcadia Publishing. pp. 59–. ISBN 978-1-4396-4328-0. ^ "Leftfield Records". Leftfield Records. Retrieved 2017-10-07. ^ "The VLA Explorer". National Radio Astronomy Observatory. Retrieved 30 September 2017. 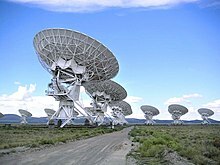 Wikimedia Commons has media related to Very Large Array.